Origami Paper Mega Pack - GEOMETRIC PATTERNS - 5 7/8"
Print Origami Paper → Origami Paper Mega Pack - GEOMETRIC PATTERNS - 6"
Are you looking for a large pack of origami papers that will provide hours of folding enjoyment? This economical pack of Floral Patterned Origami Paper is perfect! 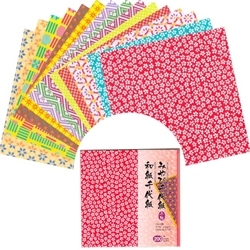 Are you looking for a large pack of origami papers that will provide hours of folding enjoyment? Or, do you need a large amount of origami paper for a school, art class or church? Then this economical pack of Geometric Patterned Origami Paper is perfect for you. Each origami pack contains 200 sheets of many different patterns. Each sheet measures 5 7/8". This mega pack is also available in Floral Patterns and Tie-Die Patterns.